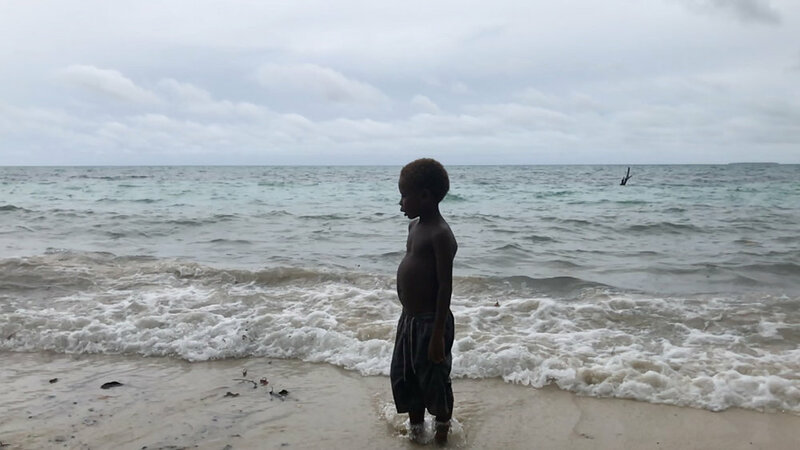 Pacific Youth Facing Climate Change — . Pamela is from Choiseul province in the northwest of the Solomon Islands. Her family work on a farm and she has a busy schedule of chores in addition to her school work. 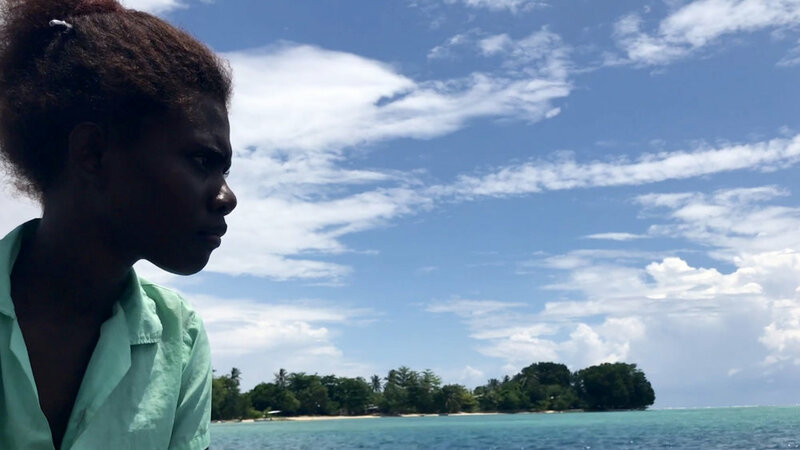 Taro, where she goes to school, is vulnerable to sea level rise so the government is planning to move the whole community to the mainland. Pamela and her friend take a break from collecting water and chopping firewood to play a game on the steps of her family home. 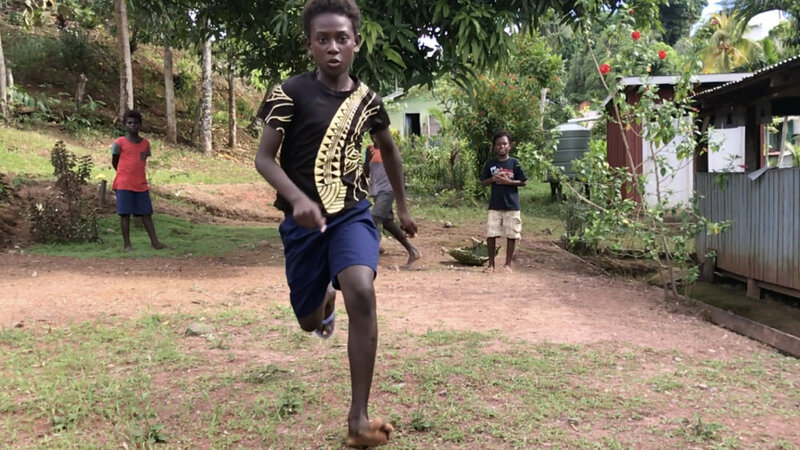 A rich culture of songs and stories is woven into the fabric of Solomons life. The collective farm where Pamela lives allows families to share the work and the costs of heavy machinery like a tractor. Despite the fertile soil, Pamela doesn’t want to live as a farmer because of the looming threats of increased droughts and floods with climate change. “When I see houses destroyed by the sea, I feel sad and I feel scared,” says Pamela. The low laying atoll where she goes to school continues to erode with the rising sea. Thanks to the project, the shrinking island of Taro now has a water system to help the community live with dignity while they plan an orderly retreat to higher ground. The sea continues to rise on the shores of Taro, threatening homes, businesses and people's lives. Tanesha is from Tigoa in the Polynesian province of Renbel in the southwest of the country. About a decade ago, when she was a young girl, logging started on her island and now it’s impossible to avoid in the forests of Rennel. Tanesha says the profits from the logging is hurting her community and their Polynesian culture. Tigoa is a provincial capital that’s built around the airstrip. In the evening when no planes are expected, young people like Tanesha turn the open ground into a sports field with soccer, volleyball and lots of laughter. The project has provided better access to water in the community so that means girls and boys get more time for studies and sports. “We have to keep our traditions alive by living them,” says Tanesha. Climate changes have made farming harder so many are turning to imported food, but Tanesha continues to use the staple coconuts and keeps her culture going by learning the weaving and songs of her ancestors. A short walk out of Tigoa brings you to the logging camps of Rennel. Piles of logs await the trucks to be hauled and loaded on to ships bound for Asia. Logging and bauxite mining have left devastated landscapes and impacted water sources in some areas. Gizo is vulnerable to extreme storms and sea level rise, and with climate change it will have to deal with both. But the most pressing concern for citizens of Gizo is water. Longer droughts and inadequate storage leave many in a daily struggle to find enough clean water for their families. SIWSAP has helped increase the water storage but the underlying challenges for Gizo remain. While town living is coveted by many in the provinces as an easier life than subsistence farming or fishing, it can leave families cut-off from food sources and support networks. 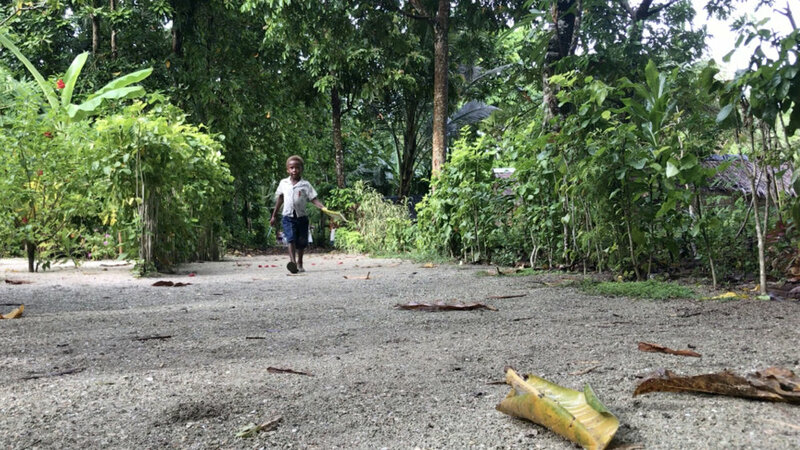 Fabian has few chores at his home in Gizo, but he knows the family could face hunger again if a cyclone hits. In a country with less than 20% literacy, paper and pencils are a luxury item in some communities but not for Fabian in Gizo. For him, it’s an important part of life and he fills sketchbooks when he’s not busy on the soccer field with his friends. Santa Catalina island in Makira province. Cathy is from the island of Santa Catalina in Makira province. The low laying atoll is rapidly eroding as a result of sea level rise and the community is facing hard choices trying to feed a growing population with reduced arable land. The approaching sea blurs the line between the beach and the coconut trees. Not only are trees being taken by the sea, but salty water is leeching into fresh water sources causing more trees to die and health issues for the whole community. New wells, more water tanks and a desalination unit will help the community get enough water for everyone. Cathy’s father heads out to sea in a traditional canoe to catch enough fish for the family. Changing weather patterns have resulted in unpredictable storms that have claimed the lives of many fishermen. Cathy says her father nearly drowned last year when his boat was smashed on a rock in a storm. While he managed to swim to safety and goes fishing every day, Cathy worries when he heads out in rough seas. Santa Catalina has a dozen open wells like this one. The water is sometimes salty and only usable for washing dishes and laundry. 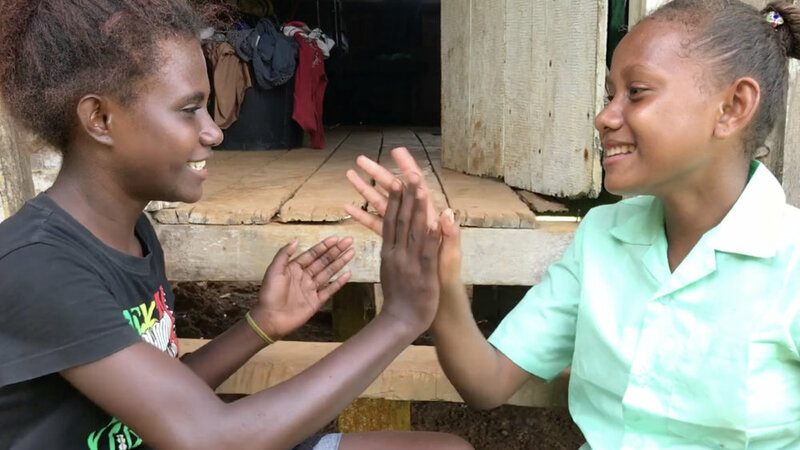 Like most girls in the Solomon Islands, Cathy is expected to cook, clean and garden before she gets to her studies. The project will make water more accessible and hopefully make more time for reading and math homework. Nathan is from Tuwo community out on the Reef Islands of Temotu province. He’s seen the sea wash away neighbours homes in king tides and he worries about his family when there are big storms. Despite centuries on the islands, Nathan’s people now face an uncertain future as sea levels continue to rise. Nathan lives in one of the the houses with a thatched roof that dots the coconut groves along the coast of Fenualoa island. The approaching sea is driving people to build in the forests but this shift reduces arable land for fruit trees and the community may face food shortages in the future. While Tuwo is protected from direct hits from cyclones because it opens to the northeast, the sea advances relentlessly on Nathan’s island. The project has helped with new wells and water tanks so the community now has time to plan a move to the mainland.